Precious metals were mostly flat this week as investors rushed to the US dollar for safety. The Turkish lira plunged and Russia’s rouble, the euro and pound also dipped significantly. Both gold and silver prices were flat on Friday (August 10), after investors ran to the greenback for safety as the Turkish lira plunged to a record low after dipping almost 23 percent. Meanwhile, Russia’s rouble dropped to its lowest in more than two years and the euro and pound met their weakest levels in a year. As of 10:57 a.m. EST, the yellow metal was trading at US$1,216.20 per ounce and mostly flat for the week. As for the white metal, it was trading at US$15.47 per ounce as of 11:09 a.m. EST, and also finished the week mostly flat. This week’s declines have left many market insiders speculating when this bear market will end. “The movement in the gold price remained quite flat this week. 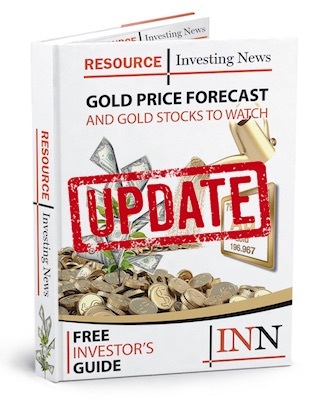 We believe the price range of US$1,200-US$1,230 is a strong resistance for gold both on the downside and the upside,” Bhakti Pavani, senior research analyst at A.G.P./Alliance Global Partners told the Investing News Network. Hansen also noted that there is additional pressure from expectations that the US Federal Reserve will raise interest rates next month, bolstering the dollar and US bond yields and damaging the appeal of non-yielding gold. For their part, platinum was down slightly, while palladium made slight gains for the week, trading at US$830 per ounce and US$907 per ounce respectively as of 11:40 a.m. EST. Our top precious metals stories this week featured Condor Gold (TSX:COG,LSE:CNR) completing the three-year permitting process for its US$120-million gold mine, South Africa’s Krugerrand being available in silver for the first time and construction delays at Fortuna Silver Mines’ (TSX:FVI,NYSE:FSM) Lindero gold project in Argentina. British miner Condor Gold (TSX:COG,LSE:CNR) completed the three-year permitting process for its US$120-million La India gold project in Nicaragua. The company said on Monday (August 6) that it is committed to building the mine despite ongoing political protests in the country. According to a press release, Condor was granted a permit for a mine and processing plant at La India. The plant will have the capacity to process up to 2,800 tonnes a day and will produce approximately 80,000 ounces of gold a year. “I am delighted that the Ministry of the Environment and Natural Resources [MARENA] has granted Condor Gold the key environmental permit for the development, construction and operation of a processing plant,” said Mark Child, chairman and CEO of Condor. The new silver bullion Krugerrand went on sale this week, marking the first time in the Krugerrand’s 51-year history that it has been made with a metal other than 22-karat gold bullion. “Extending the Krugerrand brand to silver lends it an immediate and unique property as an attractive asset class. The brand’s illustrious pedigree is likely to attract interest from investors and collectors alike,” said Richard Collocott, Prestige Bullion’s director and Rand Refinery’s commercial executive head. Fortuna Silver Mines’ (TSX:FVI,NYSE:FSM) Lindero gold project in Argentina hit construction delays, but claimed that commercial production is still scheduled to begin in Q3 2019. Building delays at the site have limited Fortuna’s ability to start certain contracts, and that has shifted the planned start time for commercial operations from early to late in the third quarter. “With a large portion of our major contracts awarded, our project team is working on opportunities to further optimize the sequencing of concrete, electromechanical and piping installations to streamline the project’s schedule,” said Jorge A. Ganoza, president, director and CEO of Fortuna. Also making news this week is Pretivm Resources (TSX:PVG,NYSE:PVG), which reported its financial and operating results for the second quarter and first half of 2018. Pretivm revealed that during the second quarter the company produced 111,340 ounces of gold and had revenue of US$146.5 million on 115,309 ounces of gold sold. Additionally, the company had net earnings of US$31.1 million, adjusted earnings of US$47.0 million and it achieved first half 2018 guidance with a total of 187,029 ounces of gold produced at an all-in sustaining cost of US$783 per ounce of gold sold. “Our cash balance increased by more than US$72 million through the quarter to US$142.5 million as a result of our improved production at lower costs,” said Joseph Ovsenek, president and CEO of Pretivm. “In the first half of the year, we’ve reached steady state production, fully implemented our grade control program and met our production guidance. We intend to build on this positive momentum for the remainder of the year, firmly establishing Pretivm as a premier high-grade gold producer,” he added. Finally, Caledonia Mining (TSX:CAL,NYSE American:CMCL,LSE:CMCL) announced its Q2 results with marginal output increase. The company’s 49-percent owned Blanket mine in Zimbabwe produced 12,657 ounces of gold in the second quarter, slightly higher than that produced in the second quarter of 2017 and in line with expectations. “The second quarter was a difficult quarter for the business as production was adversely affected by lower-than-expected grade and tonnes mined,” said Steve Curtis, CEO. “Grade for the quarter was 3.19 grams per tonne. This is below target due to difficulties in accessing broken ground at AR South and higher-than-expected dilution at the Blanket orebody due to the introduction of long-hole stopping on the grounds of safety,” he added.